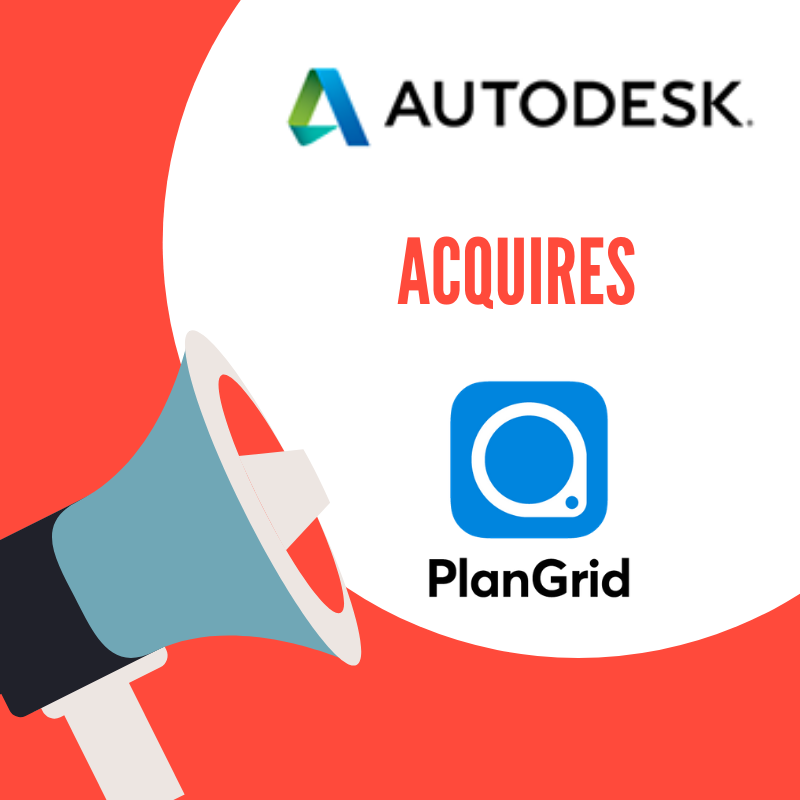 Autodesk has just acquired PlanGrid for $875M, one of the early Industrial Connected Worker vendors. There has been a lot of talk in the Industrial Internet industry about consolidation, such as vendors going out of business, becoming irrelevant or being acquired. This is one of the early transactions involving a major software vendor, so it deserves some notice. Everybody expected Oracle to make a first move, but Autodesk surprised us here. PlanGrid was one of the early Construction Connected Worker vendors. Actually, in 2016 a very close friend did an extensive market analysis for a digital tool that would help streamline end-to-end construction processes and selected PlanGrid. But, since then too little product development progress was made: the product was good, but their overall flexibility to more use cases and processes was lagging behind. Selling the company to a well-known software company may be a very good outcome for PlanGrid (speculation, I have no inside information on this). More and more I’ve come to believe that great operational improvement initiatives go bad if asset data is not synced with human data. A productivity system needs to have a great connection to the different asset systems. Autodesk clearly takes the integrated approach (as they always do), and I believe this is a good move. The Connected Worker is a white-hotspace. There are over 50 vendors on the list, which is way too many as it confuses the market. So one fewer vendor, although always sad for the individuals involved, is not a bad thing for the market as a whole. Most Connected Worker companies are relatively small. Even industry leaders like www.FATFINGER.io, iAuditor & Parsable are relatively small compared with vendors in more established software categories. This is one of the first serious Connected Worker initiatives by a major software player. Other Automation vendors claim to do Connected Worker Automation, but I believe those claims are unsubstantiated and a lot of vaporware. So the Autodesk move shows that Connected Worker is becoming a mainstream category. On a product-level, Autodesk is getting their hands on a very feature-rich product. I know first-hand that it’s a very powerful system. This is a good fit with Autodesk’s main customer base: mid to large companies. There is also a good fit from a technology perspective. The PlanGrid product offers a range of features that might go nicely with Autodesk’s wider product offerings. And, it should be reasonably easy to integrate PlanGrid code into Autodesk applications. I think this deal signals the beginning of a 2-5 year consolidation of the Connected Worker industry. Flexible platforms that empower frontline teams to create apps in seconds to keep up to continuously changing business needs are a key to success. The winners will have tied their applications into vital planning, asset, production and maintenance processes and systems, either through integration or through acquisition. My advice for Industrial Internet and Connected Worker professionals is to hedge your bets: your Industrial Internet vendor may not be around in a couple of years. FAT FINGER.io is the leading software platform to rapidly digitize form-based workflows that are traditionally done on paper, Excel and clunky outdated systems. In seconds anyone can create enterprise apps using an easy drag-and-drop no code builder. FAT FINGER then uses machine learning to coach app users in real-time to make safer and improved decisions.